GO: We Will. You Should. Last year I halfheartedly told myself that I picked a ‘word’. It wasn’t until I read my buddy Ann’s post the other day- that I felt the idea of choosing a word for the year was given more credibility and I should really think about mine. Hers is ‘focus’. I like that. I rolled some words around in my mind for a few days and decided not to push it. I wanted this word to be a part of my family- not necessarily define us, but compliment us instead. So- with some exciting news from my husband yesterday- it was decided. ‘GO‘ would be our word. Because we will. We must. This year is filled with a lot of unknown – where we will be, where we should go. All of the places we still need to see if we do indeed leave Europe this fall. With this in mind, we know we have to go, we have to leave. But until then- by gosh we are going to see everything we can before the time comes. No more being lazy on the weekends. Well, every weekend, anyhow. Even if it’s just a day-trip away- we need to explore. We need to GO. With that, last night my word was clear. My husband emailed me during the day to say that he saw a great deal on plane tickets to Rome. We laughed about it for a bit.. but then thought why not? Rome is on our must see agenda. Time is not something we have an endless amount of right now- even though during the day-to-day it feels that way. It was decided. We are going to GO. Normally with a family trip to a place like Paris we plan months out and research where to stay. We all but book the hotel before we get our plane tickets. We have a plan and a strategy in mind. With Rome, we have nothing other than our plane tickets. No idea on where to stay just yet- no real agenda, and apparently no double stroller since it won’t fit on the plane. Our flight is in about a week. This is just not done when you have three little kids. So there you have it! We’re just going to go. Our time here is short. We need to make the most of what we’ve got. We’re going to GO, and so should you. When was the last time you went on a spontaneous trip and where did you go? Linking up with the ever-fabulous SJ in Croatia. If you don’t know her- you need to! 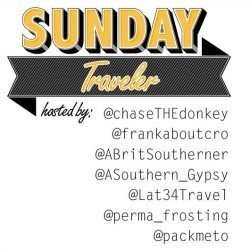 Check out Chasing The Donkey and these other fine folks at the Sunday Traveler. Perfect! I think the last minuteness of this trip makes it awesome! I so wish we could go, too, so I’m going to have to just wait and hear all about it when you get back. I wish you could too- but yeah, kind of last minute indeed! We still don’t have a place either 🙂 Here’s hoping it all goes ok! This is the regret I live with to this day. We never made it to Rome. Our plan was to visit before our return, like a goodbye trip. But the madness of relocating crept in 3 months in advance, there was absolutely no time to plan or think about a trip. If I had known, we definitely would have made it earlier. For now, we have fond memories of our 2 week road trip through the Ligurian Coast, Florence and Venice. Yay for Rome. You will love it. So much to see. A positive spin on the no stroller….you can do the hop on/hop off tour of Rome without the hassle of a stroller. A great way to see the city. skip the 3 hr line to see the Vatican and opt foR the vatican museum…you still get to see the Sistine Chapel and the line will be only 10-15 mins. We need to have one though- I’m currently checking out the rental companies- at least for one day. Our guys will need to nap somewhere- since we won’t be going back to the hotel to do so. Hoping to do the hop on hop off thing one of the days too. And good tip about the museum! I love it. Can’t wait to hear how you like Rome. Here’s hoping this is not the worst idea we’ve ever had! We’ve done a few trips like that (one of our trips to Paris and a separate four day trip to Nice during Carnival) all the way from North America, so the ‘last minute’ part was 2-3 weeks in advance notice. Our move to Switzerland was also slightly last minute – decision to go was in March and the move was in May!! Wow! You are brave! I’m nervous- as if it were just my husband and I, that’s not too much to worry about. But with the boys? I think we might be a little crazy. Oh… the last minute trips were pre-children!! The move, however, was with a 21-month old. I’m glad you guys were able to do that pre-kids. For some reason we didn’t do nearly enough before the brood. That is such a perfect word, for you and really for anyone. Sometimes you just need to get up and go. Good luck and have fun in Rome, it is a a beautiful old city and one that I hope to GO back to. FIrstly, yay to linking up – I’m so pleased to have you here. Secondly and more importantly YAY to Rome. Who cares about preparation, when you have the Colosseum, Pathenon and by golly all of that pasta. My top tip is to enjoy the Vatican tour BEFORE it opens to the public. Its costs more, but it’s worth it without all of the crowds and noise. GO GO GO and enjoy. PS: have pinned this post, I do hope that’s okay. Thank you my friend! I still have to GO to Croatia. I have not forgotten! For day trips, I’ll often decide the morning of. For vacations, the quickest I’ve booked is 2 weeks. I love it because I can’t stand to wait once I know I’m going somewhere. But we have one kid who’s almost 7 so it makes it much easier. For the first 3 years of his life, we took two car trips because I was paralyzed by fear! Yes- mostly all of our day trips are by car, or by train (and that last one by train was a vomit-filled disaster). After that though- being one of my biggest fears while traveling behind us, I feel a little more hopeful that we can handle what comes our way. Time will tell. I totally get that paralyzing fear! I love that you’re just “going” to Rome. I recently booked cheap flights to Paris. It’s not until April, but it is only two days after we arrive home from Stockholm. Normally I’d have said I couldn’t possibly just come home and go again, but why not? I really want to revisit Paris. So I just booked it. Yes, it will be a busy 10 days, but Stockholm and Paris? I need to go! Listen to us! Oh, Paris, Rome, Stockholm.. let’s go! What lucky, lucky people we are 🙂 Have a FANTASTIC year of adventures ahead Clare! Sometimes one just has to go. It’s great to travel on a whim – we’ve been guilty of that too, and have always had amazing results 🙂 Lovely post, congrats! Good luck and hope you enjoy Rome! It’s a fascinating city! Thank you! We’re so excited. I have wanted to see it my entire life. That’s a good one, as words go. Good luck. 🙂 Rome’s a great city and now’s a good time to go, not nearly as crowded and you won’t have to deal with heat. Enjoy! Thanks Bob- that’s my hope. One thing we learned being over here is that traveling around off season has many many benefits indeed. The heat being one of the top five for sure. I like your word! I think I need more ‘go’ in my life this year, too. sounds so exciting! I love this word! How inspiring. Thanks- we’re all pretty excited. Can’t wait! Love it! And I definitely want your tips for seeing Rome with 3 kids. I was rather intimidated by the idea (but also, that was in the sweltering summer), but I know it can be done! Have a great time!! We shall see, that’s for sure! Our worst trip thus far was in sleet and snow in Munich this past spring, we were so miserable. I keep telling myself we can do anything if we could do that. Love, love, love it. Good for you! And I like the idea of having a word. I’m going to steal it and make mine ‘Do.’ You Go, girl. I’ll Do. Love it! Just go! 🙂 Living in the moment is good for the soul. I’m sure you will find plenty to see and do in Rome. And remember – eat lots of gelato! Just GO! Rome is beautiful. Looking forward to read everything about your time there. Curious to see how it will turn out to be considering it’s your first travel with three kids on such a short notice. Enjoy it! Thanks for linking to #SundayTraveler.